Long before La Verne died and Eddie lost his anchor, he was a drifter. La Verne used to say Eddie was the kind of man who was gone before he got there. Then she’d open her mouth and laugh halfway down her throat, showing the sweet gap in her front teeth. Eddie had heard her talk about his wandering ways too many times to laugh, but he never tired of seeing the gentle roll of her belly under her dress when she chuckled at her own remarks. With friends laying back on the couch waiting for the football game to start, he’d study the toes of his boots and smile at her over the rim of his contentment like a cream-licking cat. On Saturday mornings in recent times, she kept her eyes closed when Eddie got out of bed before the sun. She’d fit the familiar sounds to Eddie’s movements as he prepared for his run—the rustle of jeans pulled up and zipped, the predictable clunk of a dropped boot –to her memories. She’d hear the squeak of leather and pull the pink comforter tighter under her chin. She knew he had his gang colors on, but wasn’t afraid. He always made it back. Her mind swayed with the rhythmic prelude and reminders of when they used to ride together and she’d clung to his back, hands locked around his soft belly. The pain pill set by the bedside, the soft closing of the bedroom door, then hot cracks from the bike firing up. The horn’s one short beep signaling he was off. She’d rest in the familiar images of Eddie in the saddle, stretching to his full height in the brightening morning light, then she’d slip into the darkness of her pain. After 27 years of marriage, Eddie’s heart crashed and burned when she left. He laid his bike down, throwing sparks and spinning out, broke his ankle, sat expressionless in the front row at the funeral home, shook hands, said thank yous. He left his old gang and hung up his colors. About a year ago Eddie sat doodling at the kitchen table where he and La Verne used to drink coffee and eat cinnamon rolls on Sunday mornings before she got sick. Back then they’d go back to bed for some extra sweet stuff. This morning sunlight cast its gold across Oakland and the streets were still, then the silence broke and he heard a far-off rumble, probably a flathead Harley, he thought. 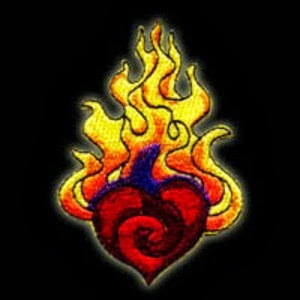 Without thinking, he designed new colors for the back of his riding vest – a flaming red and orange heart. He found some new boys – professionals and businessmen like himself – and they put on the colors too. Today they’re running to Capay Valley, following the course of Cache Creek spilling down the Mayacamas Mountains, the water searching for the Sacramento, but stopping where the road connects to Interstate 80 for the trip back home to Oakland. I met Eddie at the Jack-in-the-Box in Vallejo, where Highway 37 crosses Highway 29. I was running late for a Saturday writing workshop and he saw my impatience, let me order ahead of him, told me about where he and the boys were headed, asked me if I wanted to ride sissy. I shook my head, glanced at his bike, started to say no, but he interrupted, said if I waited, all I’d get is older. Seemed like he knew what he was talking about and I believed him when he said all I had to do was hang on tight. Next Saturday Eddie and the Drifters will run someplace else and I’ll weigh anchor and drift with them wherever they go. Iron Legends, motorcycle history from Harley-Davidson. Fiction sketch from Book Passage workshop with Jon Carroll, San Francisco Chronicle columnist. It’s true I met Eddie and members of his motorcycle club at Jack-in-the-Box in Vallejo on the way to the workshop on writing personal essays. 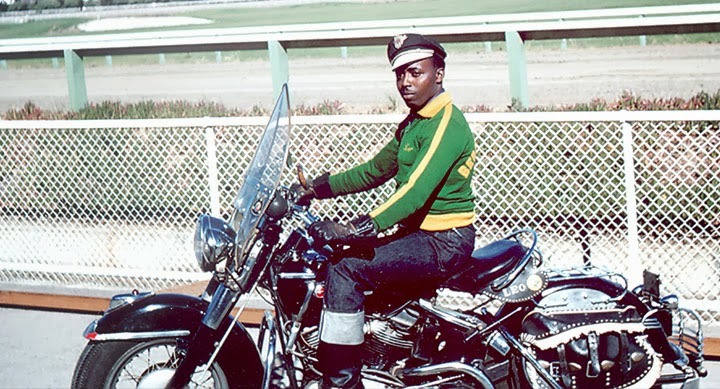 Eddie and the gang were decked out in riding leathers and heavy boots and Eddie was kind and funny when we talked. I felt a wistful sadness in him. Personal essays are about rendering the actual artfully. I actually met Eddie. 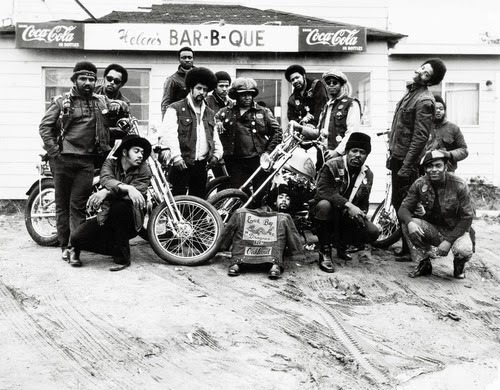 The rest is fiction fueled by old photos and a dip into the fascinating history of Black motorcycle clubs in America. Hi Kate 🙂 Nancy Barth wanted me to share this experience I wrote on my Facebook page tonight. My writing was done in a hurry and it definitely was bursting from my brain. I could not get the image out of my head until I wrote it somewhere 🙂 Loved your post above ! Thanks so much for sharing your writing in the Word Garden. 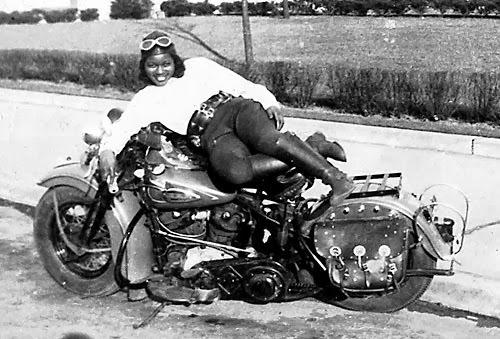 Your image of an older woman on her Harley, hair blowing, arms flapping in the breeze makes me smile and hope for bravery as I age and a new tank top. Maybe I'll catch up to Eddie. I know he's just around the bend, grinning and lane splitting.